A great choice for a small group or when you don't want a full service package. We pre-scoop our ice cream cups with the flavors you choose. Additionally, we'll combine the delicious sauces, toppings, spoons and napkins, ready for delivery and easy setup. 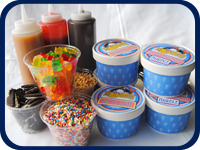 Karen's Kreamery scoops up the fun with a party package for all of your guests that are sure to please everyone. We make sure you can relax and have a great time. We supply all of the essentials to scoop up the fun: cups, spoons, napkins. We offer full service catering from our old-fashioned ice cream cart or Trio Gelato bar with our cheerful and attentive wait staff. Great for weddings, graduation parties, picnics, family reunions, birthdays, or just because. Old Fashioned Vanilla, Chocolate, and Strawberry with six assorted toppings. 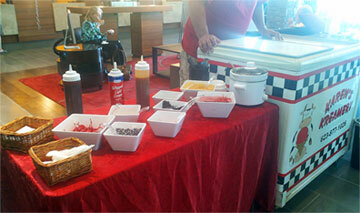 Sundaes include whipped cream and cherries. 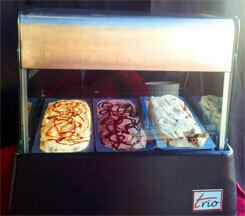 Choose any 3 flavors of our fresh gourmet Ice Cream or Gelato. Served in our counter top Trio glass display case. Two scoops of vanilla ice creamÂ floating in your favorite soda. 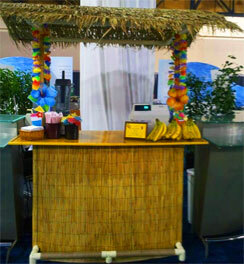 Smoothies are non-dairy and served in our portable Tiki Bar. Great for school, office, pool or sports team parties, birthdays. 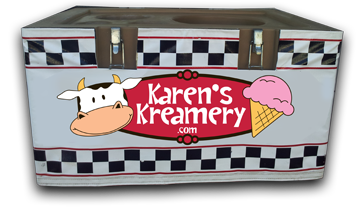 Our insulated cooler keeps the ice cream cold without electricity for up to four hours!Â Delivery is available for an additional charge. This all inclusive Sundae Bar comes with everything you need to serve Sundaes including cups, spoons, napkins, whipped cream and cherries. If you have any questions, please feel free to call and talk to Karen at (623) 877-1026. Catered service requires minimum charge of $200.00 toward total price.